Studies show that youths who learnt horsemanship skills showed better decision-making, thinking, communicating, goal-setting and problem solving skills. Working with horses helped them develop values and life skills that they transfer to their everyday life. In addition kids gained more Confidence, Leadership Skills, Compassion, Patience and got more Exercise. The lessons kids learn from horses are too valuable to give up on. 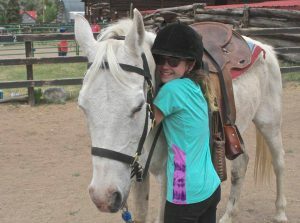 Many of the rescued horses at End of the Trail Rescue, Inc., can be used to learn horsemanship skills and how to ride. We have horses for all levels of riders. So kids won’t have to own a horse to participate! This program will be launched as part of our expansion, so please stay tuned for more information.